Romantic woodland inspired wedding invitation. League Gothic is a grotesque sans serif designed by The League of Moveable Type, an open-source type foundry dedicated to making the most well-made free and open-source fonts. League Gothic is a revival of the old classic sans serif Alternate Gothic #1 designed by Morris Fuller Benton. The typeface is available in regular and condensed weights with matching italics. 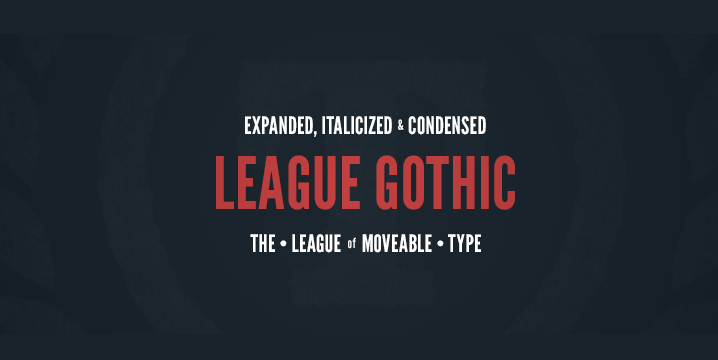 League Gothic is free for both personal and commercial use and you can download it for free at TheLeagueofMoveableType.